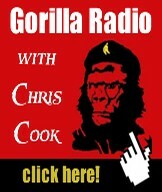 Gorilla Radio blog: Does It Take Another War in the Woods to Get John Horgan's Attention? Does It Take Another War in the Woods to Get John Horgan's Attention? Port Alberni - Conservationists with the Ancient Forest Alliance (AFA) were dismayed last week to discover that the BC government's logging agency, BC Timber Sales (BCTS), has auctioned off at least 300 hectares of some of the world’s grandest old-growth forests in the Nahmint Valley for logging, with thousands of old-growth trees already having been cut down this spring. AFA campaigners TJ Watt and Andrea Inness, arborist-conservationist Matthew Beatty, and local Port Alberni conservationists Mike Stini and Ariane Telishewsky, came across the new clearcuts and road-building operations with enormous, 12-foot-wide, freshly cut logs of ancient cedars on May 6. The campaigners also identified an enormous Douglas-fir tree, which they dubbed the “Alberni Giant”, that is wider than the fifth widest Douglas-fir tree listed in the BC Big Tree Registry at almost 11.5 metres (38 feet) in circumference or 3.7 metres (12 feet) in diameter. In addition, they found a Douglas-fir tree 3 metres (9.9 feet) in diameter, making it wider than even the widest Douglas-fir in Cathedral Grove, which is 2.8 metres (9.2 feet) in diameter, as well as a massive 4.3-metre or 14-foot-wide western redcedar. "The BC NDP government is fully in charge of BC Timber Sales' mandate. For them to let their own logging agency auction off logging rights to some of the largest and oldest endangered trees on Earth is like enabling the slaughter of elephant herds or the harpooning of blue whales. "It’s the very opposite of sustainable forest management. The new NDP government needs a serious wake-up call. They need to end the status quo of old-growth liquidation - for starters, BCTS must stop issuing old-growth cutblocks - and instead ensure a sustainable second-growth forest industry," says AFA forest campaigner Andrea Inness. "It's brutal, what’s happening out there. In advance of our trip I researched where the finest old-growth stands might be located based on Google Earth satellite maps and each one turned out to have a logging cutblock placed on it – cutblocks planned and issued by the BC government's own logging agency. "We visited many spectacular trees on the day we arrived – some trees bigger than even those found in Cathedral Grove – and, by the second day, many of them were already on the ground. It’s a full-on assault. All day long the sounds of chainsaws, drilling machines, and huge trees crashing down boomed throughout the valley," states TJ Watt. “Only about 1% of the original old-growth Douglas-fir stands still remain on BC’s coast, and just about the finest stands are here in the Nahmint Valley. The area is also prime wildlife habitat for so many species. Having explored the forests around Port Alberni for decades, I can say with confidence that the remaining old-growth forests in the Nahmint are a first-rate conservation priority,” says wildlife expert Mike Stini of the Port Alberni Watershed-Forest Alliance. “In partnership with First Nations and communities, we will modernize land-use planning to effectively and sustainably manage BC’s ecosystems, rivers, lakes, watersheds, forests and old growth, while accounting for cumulative effects. We will take an evidence-based scientific approach and use the ecosystem-based management of the Great Bear Rainforest as a model.” (see page 61 of their platform at: https://action.bcndp.ca/page/-/bcndp/docs/BC-NDP-Platform-2017.pdf). If taken literally and seriously, this would almost certainly result in the protection of the remaining endangered old-growth forest on BC’s southern coast and in the BC Interior, where old-growth forests are far scarcer and more endangered than in the Central and Northern Coast (Great Bear Rainforest) where 85% of the forests (including the vast majority of the old-growth) were set aside in protected areas and under the ecosystem-based management reserve networks. Several environmental groups, including the Ancient Forest Alliance, Sierra Club BC, and Wilderness Committee, are calling on the BC government to implement a series of policy changes that can be rolled out over both short- and longer-term timelines. This includes a comprehensive, science-based law to protect old-growth forests and financial support for sustainable economic development and diversification of First Nations communities, known as “conservation financing,” while supporting First Nations land use plans. While these longer-term solutions are being developed, an interim halt to logging in old-growth “hotspots” - areas of high conservation value - must be implemented to ensure the largest and best stands of remaining old-growth forests are kept intact while a larger plan is developed. There are also a number of policies that can be readily implemented more quickly. For example, the NDP government should direct BCTS to discontinue issuance of old-growth cut blocks and support the implementation of conservation solutions in such rare and endangered forests. 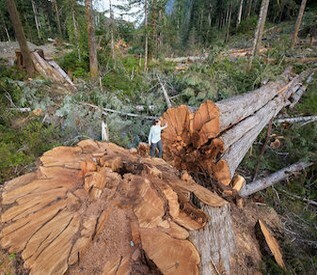 In addition, there needs to be an effective big tree protection order with buffer zones and forest reserves such as many Old-Growth Management Areas that currently exist only on paper should be made legally binding and the system should be quickly expanded to protect additional endangered old-growth forests. Finally, annual funding needs to be directed to establish a park acquisition fund, which would allow the BC government to purchase and protect private lands of high conservation, cultural or recreational value. 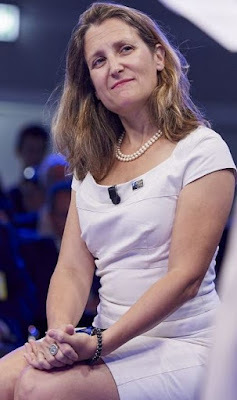 "So far, the new NDP government has, disappointingly, supported the destructive status quo of high-grade old-growth forest liquidation, raw log exports, mill closures, and unsustainable forestry in general. They need to break away from the old unsustainable mindset that has driven the increasing collapse of both ecosystems and rural communities in this province. "When it comes to forestry, the NDP have not distinguished themselves from the BC Liberals in terms of any new laws or regulations, and it’s very unwise for them to think they can take the environmental movement for granted and test its patience with excuses, heel-dragging, and PR spin while the destructive status quo rages on. "Today there is a viable, potentially sustainable, second-growth forestry alternative that the government can foster, while protecting endangered old-growth forests and supporting the economic diversification of First Nations and rural communities," says Ancient Forest Alliance executive director Ken Wu.